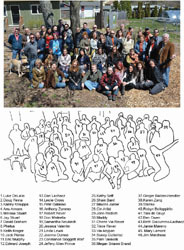 "Celebrating Valley Stream Through Art"
" Creatures Large and small"
On April 25, 2015, Stanko organized one of the largest group photos of the most prestigious Long Island artists ever to assemble in one place. THE STAGE GALLERY "FACE TO FACE"
THIRD PRIZE: "GRAPES & STRAWBERRIES"
LONG ISLAND MacARTHUR AIRPORT "ART AT THE AIRPORT"
VIEWERS' CHOICE AWARD: "MORNING ON MONDAY MOUNTAIN"
THIRD PRIZE: "DAYLIFE IN THE PARK"
HONORABLE MENTION: "MY FOLKS BACK HOME"
"Central High" painting for the museum's collection. Designed, produced and donated T-shirts for benefit held at The Kitchen Off Pine Street, Long Beach, New York on June 14, 1998. Designed, produced and distributed to politicians, environmentalists and celebrities T-shirts depicting his "Happy Earthday" painting in celebration of Earthday, April 22. 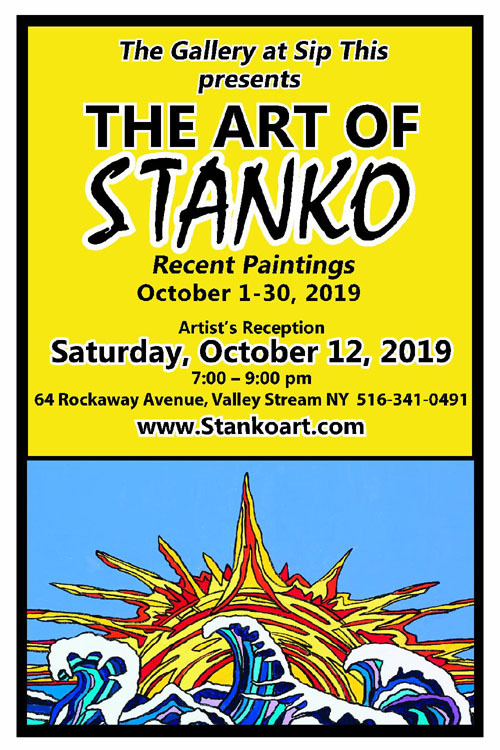 Host Valerie Forte featured the work of guests Stanko and his wife, Karen Zang. Designed T-shirts on behalf of the Artists Plate Project, sold to benefit Hunger Relief Throughout the Arts Foundation. "Beach Chairs", Indiana Fields", and Winter Craze"
Stanko donated his "Happy Earthday" painting to Vice- President Al Gore who added it to his collection.